What is involved in a Vacuum Tune-Up? test airways and suction, clean internally and externally, test. What is involved in a Tune-Up? Check machine, internally clean and lubricate, check upper and lower thread paths, replace needle (s), check timing and needle position, check feed, set tensions, clean externally, and stitch out test pattern. What will it cost? Please call for prices, we are quite reasonable. Is an appointment needed? No, just bring your machine in, we work on machines in order that they came in. What is needed to bring with machine? Power cord, foot pedal, bobbin, zig-zag foot. If embroidery, add emb unit, emb foot, small hoop. What is the warranty? 30 Day Warranty on parts we install and labor we perform from the date picked up. How often should it be serviced? We recommend at least once a year, if you sew occasionally, bring it every 2 years. Is service performed in-house? Yes, we do not transport your machine, it is kept here and serviced here. We Now Offer Sharpening Services! 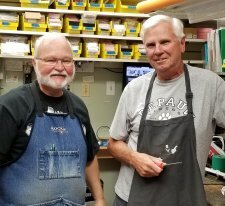 Drop off items anytime during the week by 5 PM on Mondays, sharpening will be completed on Tuesdays and available for pick-up on Wednesdays, after 3 PM. Click here for more details.